Karin's fate has been altered. With the sudden appearance of a little boy named Suzune, the adventure begins. Along for the ride are Kazune, Micchi, and Jin Kuga; a celebrity with godly powers. The gang travels through time fighting their new enemy, The Seeds of Chaos, to right the future. 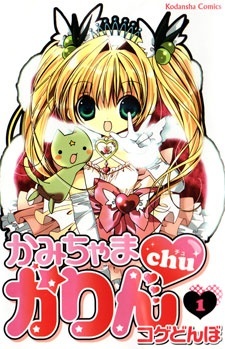 Kamichama Karin Chu was published in English by Del Rey from June 24, 2008 to January 26, 2010. I was getting really worried here. I thought the manga was going to become a Sailor Moon where the there's trouble and the heroine defeats it. If it was like that then bye bye to my perfect manga. Actually, the story gets more in-depth. You just needa endure the fight, kill, victory sequence. I know it's hard but I found it worth it. The story was nice but I can't say it was anything too special. Something about it just makes me think 'something was missing...'. As I heard before, maybe it was because so many ideas were put into one story. I truly do have a hate for that. I loved Suzune especially. He's one of my favouriute characters. He is just too cute!! Everyone look cool and cute in their own way but I didn't find Kazune very original. First thing I thought was 'It's that blond boy from Pita-Ten??'. Eventually I saw the difference. I've gotta say, the way Kazune tried to protect Karin was extremely cute. Though I didn't see too much of a change through personality throughout the story. Everyone basically stayed the same. Another pet hate of mine. With all them bad scores, I still really enjoyed Kamichama Karin Chu. It was quite my perfect manga. A sequel that shows the continuation of a relationship now that's what I like! And with little Suzune I loved the manga more!! If you've ever read the 1st initial series you know what Kamichama Karin is, and when it was at it's best. It had a ending that wrenches my heart everytime I read it, and I loved it being my first manga that was over 1 volume. However, this sequel, intended to wrap up plotholes lowers the overall standards. While, as the story was darker, which I enjoyed, the plot was questionable. Okay, so Karin and the 3 Gods of her Harem have to destroy seeds of chaos to save the future. But how, infact, does it save the future when the fighting was what did Michi and Kazune in in the first place! All the seeds/flowers/whatever seem to do in cause petty mischief, nothing future-killing. So why is my question? Also, the sequel was intended to wrap up plotholes, but it never did such thing. Why does Yuuki has god-powers? DOES he even have powers? Can he use them? Why does Kazune have a sister if he's a clone? All it did was open up a new story and ignore the plotholes that could've been filled. As usually, the art was cute big-eyed shojo, which I have no problem with at all. Karin: Karin was our normal perky shoujo heroine with a harem, like most shoujos, but atleast she can pack a punch. Still, her character never got very deep or developed at all. Kazune: Oh no. We all remember Kazune as the sexist but cute bishounen with the bad temper and mysterious past, now apparently he's one of perverted bishie bad guys too? Where did that come from Koge-Donbo*? Jin: Oh. A perverted idol who has crush on the main character. Nothing interesting. Michii: Michii, how I love you so! The weird guy with a tragic past and who is purely awesome. Nothing wrong here. Suzune: Okay, he doesn't have much of a personality 'cause he's little. But he's cute. Rika Karasuma: Well, probably the most developed character in this manga. Yay for lovable villians. I didn't really like the manga as must as Kamichama Karin. The unexplaned plotholes and new characters that range from boring- good didn't impress me. But I enjoyed the darker plot, but the eding is still odd to me till this day. And why is Shi-chan at Karin & Kazune's wedding? She's a cat! Read this if you read Kamichama Karin to complete the series, but don't expect anything too impressive. Story: This part about the manga made me cry when I saw the ending. I call the ending the "Koge-Donbo Middle Finger." That's exactly what it was, a boy (Suzune) comes from the future to prevent it's horrors from happening, only for Karin and company to have to go back in time so they never meet Suzune, and that somehow resolves the future and makes everyone happy. I believe it could have been a good story, since there isn't much manga out there about gods, and the art was so pretty and cute. Unfortunately, it was a crazy shojo manga, that acted like it belonged in an anime (Every chapter felt more like an episode filler). One thing about the manga that bothers me even more is how some of the actual god battles (such as that in volume 3) only took 5 pages or so. Anti-climatic, I call it. The last thing that bothered me about the story was how Rika supposedly needed the "Seeds of Chaos," but Koge-Donbo never explained WHY. I failed to comprehend how they were needed at all, and why Karin, Kazune, Jin, and Micchi were fighting against those seeds, when all Rika needed was to use the ring of Zeus to awaken her father inside of Jin. The worst part is that this series was supposedly made to answer questions left from Kamichama Karin, the prequel. The only question I had answered was "Why was Kirihiko so obsessed with power?" Besides that, I only had even more questions at the end of this series. At the end, I was baffled, confused, and slightly insulted. Art: It's a known fact that Koge-Donbo uses chibi style too much, but when she wasn't drawing chibis, her art came alive in every page. There were some points when I was wondering why she was using chibis, the scenes did not call for them most times. I believe they should be reserved for a select few scenes per chapter, like 7-10, not 20+. But with all the tone that Koge-Donbo used and all the ink, it really made the pages some of the most gorgeous I've ever seen her do. Character: Kazune and Jin were wonderful in this regard. They both loved Karin deeply, but by the end of the book, instead of just wanting her for themselves, they realized that it'd be better for Karin if she ended up with the other if it meant she'd be safe. It was very timely when they realized this too, Koge couldn't have picked a better time. Suzune was also good at showing development, when he went from being a helpless little toddler and turned into the god Cupid to protect his daddy. Karin's supposed development confused me. When Suzuka takes control of her body, Karin's furious about it, but then all of a sudden decides to be nice to Suzuka and have them both "go together to her body." That kindness appeared from nowhere, so I don't know where Karin learned to be nice like that (she's very loud throughout the entire series, and she really doesn't change at all). Enjoyment: Because of the fault of the chapters feeling like episodes, it actually enjoyable through each chapter. Unfortunately, it's almost always the same: Rika plants a seed, Karin and company destroy it, the end. It nearly got tiresome, then a plot twist came in volume 4, and now even though they're still fighting seeds, they are also now fighting against their foes. All the crazy, romantic plots within each chapter though got even more tiresome, and it got to the point where even Karin needing to kiss Kazune in a play didn't seem like much at all. Even the bonus at the end of volume 7 felt more like a filler, and nothing was really solved in it, besides knowing Karin and Kazune have yet ANOTHER obstacle in their love. Overall: This series is more for the blind shojo fan. If you think a lot like me, you wouldn't like this series. I've already read all the chapters online, so I'm definitely putting off buying the books. I must say, after reading Pita-Ten and then reading Karin, I was very disappointed in Koge-Donbo. I loved this manga! Along with the anime! This is a manga because it has great art and an excellent plot. I can't get over this manga+anime. You should first see the anime or everything will be confusing. Or the Kamichama Karin manga.